Visit Ford for more information on the Ford Explorer. The Ford Explorer is one of those vehicles that stand the test of time; it's been wildly popular since its introduction in 1991 and the sporty and rugged 2009 Explorer surely won't disappoint. This year the mid-size SUV receives an upgrade to the stability control system with the addition of Trailer Sway Control. 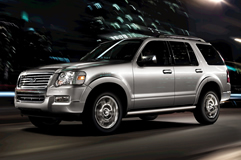 The Ford Explorer comes in four models for 2009 - the Explorer XLT, XLT Sport, Eddie Bauer and Limited. As with all Ford models a variety of packages are available to further customize the Explorer, available packages include - the XLT Convenience Package, the Eddie Bauer Convenience Package, XLT Sport Feature Package and the Sun and Sync Value package. The Ford Explorer has a crisp, roomy interior that seats five people an optional third row seating is available that allows seating for seven. Seats are cloth trimmed on the XLT models, and leather trimmed on the Eddie Bauer and Limited models. Manual air conditioning is standard with a dual zone electronic automatic temperature control air conditioning system available on the Eddie Bauer and standard on the Limited version. SYNC® in car voice-activated communications and entertainment system is available for the XLT models and comes standard on the Eddie Bauer and Limited. For entertainment during those long journeys a rear seat DVD entertainment system with an 8" screen is available for the Eddie Bauer and Limited models. The exterior of the various models are distinct and easily distinguishable. The Explorer XLT comes with body color bumpers and a four bar chrome grille, the XLT Sport features black front and rear bumpers and a black grille. While the Eddie Bauer features Pueblo Gold painted front and rear bumpers and a unique chrome 3 bar grill with nostrils. Enhanced appearance privacy glass is standard on all models with a power moonroof available as an option. There are two engines to choose from each with their own transmission. The standard engine for all models is a 4.0L V6 engine that boasts 210 hp and a fuel economy rating of 14 city and 20 highway mpg - it is coupled with a 5-speed automatic transmission. The optional engine is a 4.6L V8 that increases the horsepower of the Explorer to 292 - it comes with a 6-speed automatic transmission. Standard to all models is a 4x2 rear wheel drive system with 4-wheel drive with ControlTrac® and AWD available as options. Safety features are numerous and include a Tire Pressure Monitoring System, Latch safety seat system, Safety Canopy System, Intelligent Safety System, anti -theft system, SOS Post-Crash Alarm System and AdvanceTrac® with Roll Stability Control.